A metal gate in a tall arched opening is set in a 42"–high stucco wall that surrounds the courtyard area. The foyer is a round area – a portion of which projects out into the courtyard. It is sheathed in synthetic stone on both the outer and inner surfaces, and the ceiling is set at a lofty 15'. The entryway features stone columns and arched openings leading to different areas of the house. 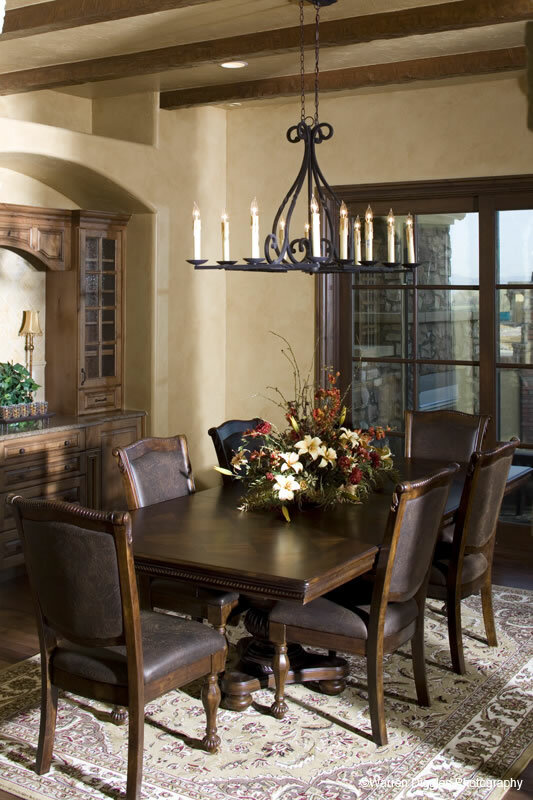 As you pass through the arched openings to your right you step down to the formal dining room. Like all of the non–vaulted rooms on this level of the house, this room has a 10' ceiling. There are built–in cabinets on the far wall, a conveniently located wine cellar behind a door in one corner, and sliding glazed doors that open to the courtyard. The arched openings straight ahead lead to either transparent accordion–style doors that wrap around a covered outdoor terrace area, or to the main living areas of the house, which are described below. The terrace space includes a fireplace, a counter with a sink on top and a refrigerator below, and a roll–down screen that can separate the terrace from an open deck at the rear of the house. The arched opening to the left of the terrace leads to a powder room, a coat closet, and a round vestibule with a ceiling that trays to 11'in the center that provides access to the master suite. The master bedroom has its own fireplace facing the bed, and a sitting area wrapped in windows that juts out at an angle for great views to the rear. 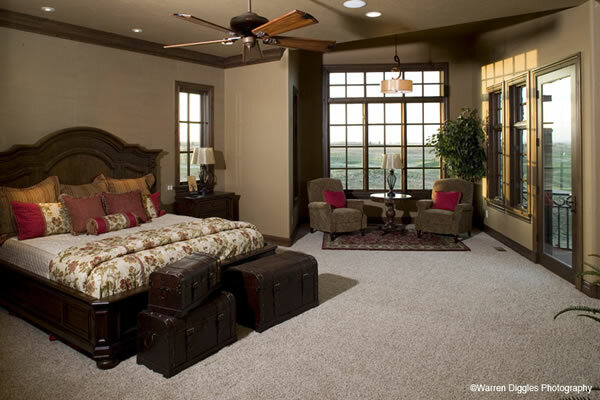 The ceiling in the bedroom rises from 10' at the edges to 10'9" in the center, while in the sitting area the ceiling is set at 12'. A door in one corner of the room opens to the decks at the rear of the house, while a short hallway with arches at each end near the entrance to the room, leads past a small wet bar and a huge closet with a washer and dryer on its way to the bath area. The master bath features an extra large soaking tub in a corner that bumps out in two directions. 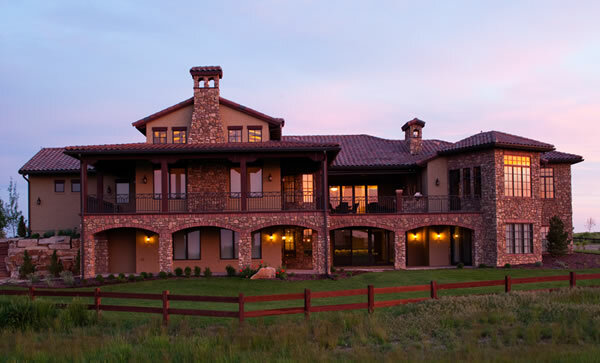 It sits beneath a 12' ceiling, is flanked by large pairs of windows, and has a fireplace niche! The bath also has an 8'5"x5' shower, two separate vanities, and a private toilet. Immediately to the left of the foyer are the stairs to the lower level, and a pair of glazed doors to the den. This room has two large picture windows facing to the side, and across from them, sliding glass doors that open to the front courtyard. There's also a door at the far end of the room that accesses an optional golf room (the original house was built next to a golf course). As you pass between the terrace and the dining room, you enter the "Great Hall". 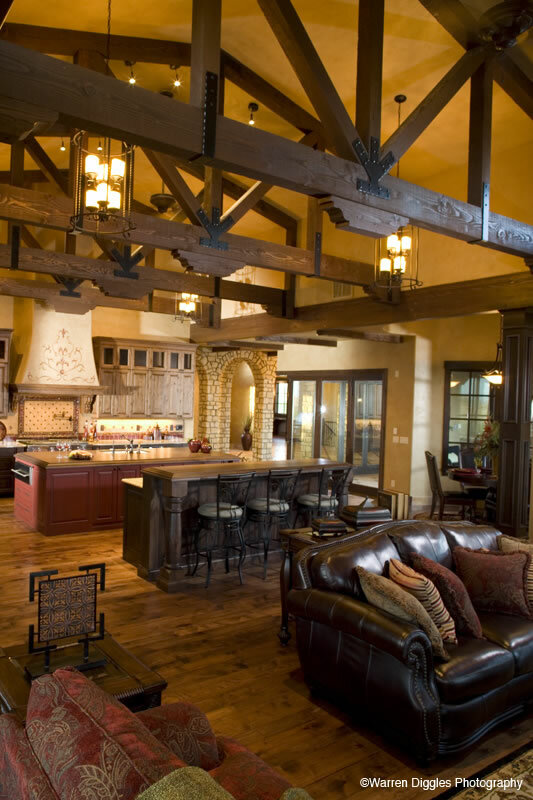 This combination hearth room and kitchen features a ceiling that vaults to a soaring 19' down the center, crossed by massive exposed wooden trusses. The hearth room has a fireplace at one end that is flanked by large picture windows that look out to and through a covered deck at the rear of the house. The deck wraps around the hearth room, and it can be accessed via large sliding glass doors on either side of the room. The roof over the deck is supported by 12"x12" rough fir posts that match the exposed rafters. The kitchen is incredibly spacious, making it ideal for someone who likes to entertain. It features two large islands – the one closest to the stove has a pair of sinks on top and two dishwashers below, while the other has a prep sink on top, and under–counter refrigerator, and a raised bar for servicing or casual dining. 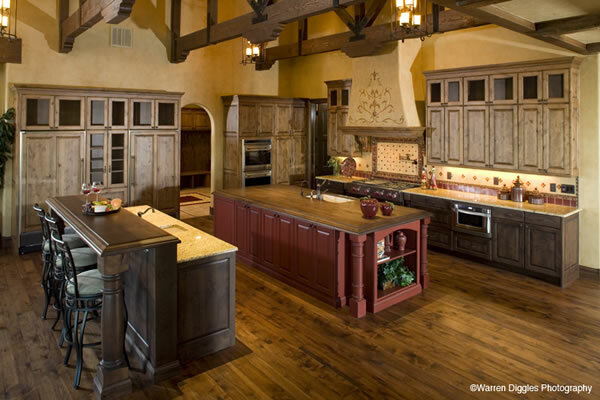 There's also plenty of room for tall cabinets, and a large walk–in pantry. Next to the kitchen is a truly unique breakfast nook. It's a round space with a 12' ceiling and a series of windows that look out to the terrace and the rear view. An arched opening in the kitchen leads to a home office, a powder room, and a mudroom. The office has a built–in desk with a window above one end that looks out to the covered deck, and a door that opens to the deck. A door in the mudroom opens to a 3–car garage. On the lower level, the open recreation area in the center includes special areas for billiards and gaming. 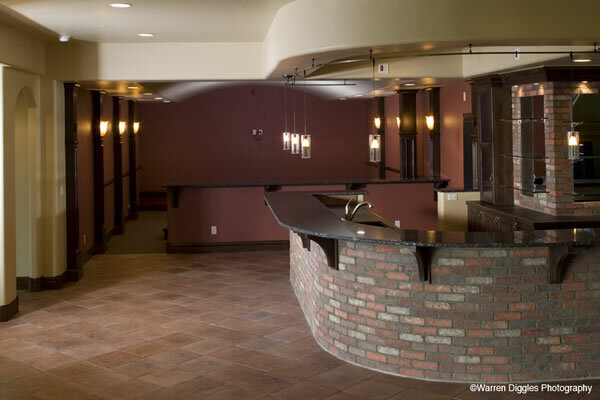 It includes a huge wrap–around bar that also services a home theater area, and a fireplace opposite the bar. Sliding glass doors open to a large patio at the rear of the house. Also located on this level are up to three bedroom suites (two of which have sliding glass doors that open to the patio), a laundry room, and a powder room for guests. In most areas the ceilings are set at 9'9", while some areas are 8'9". This stunning home reminds one of a villa in Tuscany. 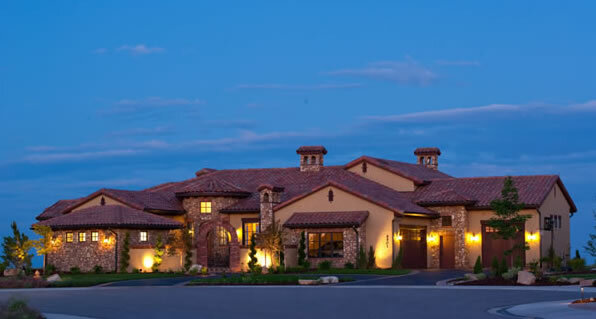 The exterior combines stucco and synthetic stone beneath a beautiful, multi–directional tile roof. 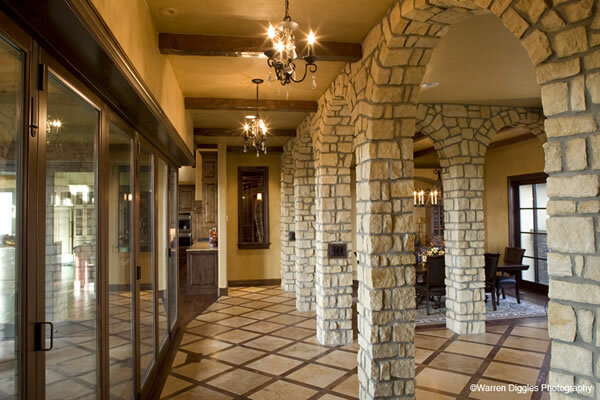 The dramatic interior features a Great Hall (the great room and kitchen combined), repeating curved stone arches at the entryway, and accordion patio doors that bring the outdoors in. There's also a large courtyard at the front with a fireplace.